Burrata is a special fresh cheese originally from Puglia. It has a solid mozzarella-like shell and filled with a mixture that resembles both milk and mozzarella. It is what I like to consider, a treasure chest of creamy fat for cheese lovers. 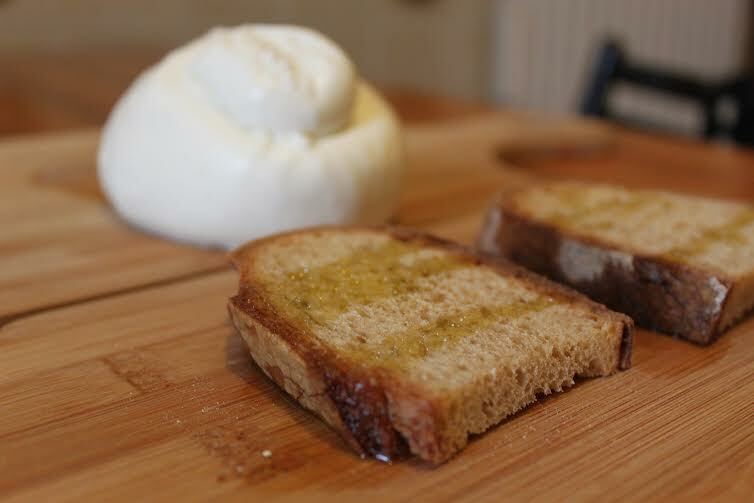 Burrata means "buttered" in Italian and it is very true to the word. It seems like the most buttery soft, creamy cheese you will lay your palate on. It is very versatile and can be used in pastas, it is especially decadent as a ravioli filling which is usually known for being filled with a leaner ricotta cheese. On it's own - it is quite buttery and creamy. Topped with a touch of marinated sun-dried tomatoes, it becomes a contrast of beautiful flavors with tangy tomatoes and aromatic herbs which these seemingly candied dried fruits are usually marinated with. An appetizer like this begs for a wine which will not compete with this melange of flavors but that will actually compliment them. I suggest a white wine or a sparkling wine with high acidity to hold up to the rich fats in this flavorful appetizer. It is fun to play with gastronomic identity when organizing meals and dishes. Burrata comes from Puglia and sun-dried tomatoes are very common in southern Italian eating. I would have suggested a white wine from Puglia to stay in the territory, however white wines from Etna have bright, nutty notes with remarkable acidity thanks to the pH in the area's volcanic soil. You could just as well pick a red wine, such as a Primitivo from Puglia with balanced acidity and tannin which fatty cheeses like Burrata also pair finely with. breadSmall loaf or half of a rustic bread, preferably Pugliese variety. Slice 4 pieces of bread longways about ½ inch thick, or thicker to your liking. Lightly toast in the oven or on the grill. Slice cheese into 8 portions. Since Burrata has a creamy center, don't worry if they don't come out to slices like with mozzarella. Cut each slice of toasted bread in half if your pieces are long. Drizzle toasts lightly with olive oil. Lay burrata chunks on top with a spoon to get all the creamy interior. Slice each sun-dried tomato longways to create 3 strips and lay on top of burrata toasts. Serve 2 pieces per person to serve 4 people as a light appetizer. Finish with salt and pepper if desired. Wine Pairing: Etna Bianco from ValCerasa. Coral is a gourmet blogger originally from Seattle and leads food and wine tours in Florence and around Tuscany. You can read up on her blog and tour offerings here.